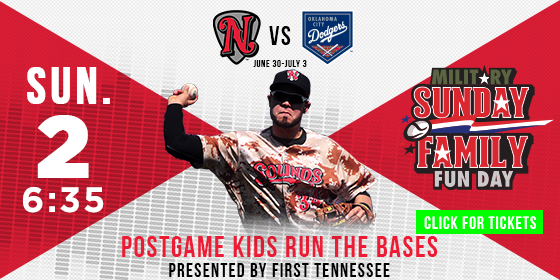 The Nashville Sounds Baseball Club returns home Monday, June 26th to open another eight-game homestand at First Tennessee Park. 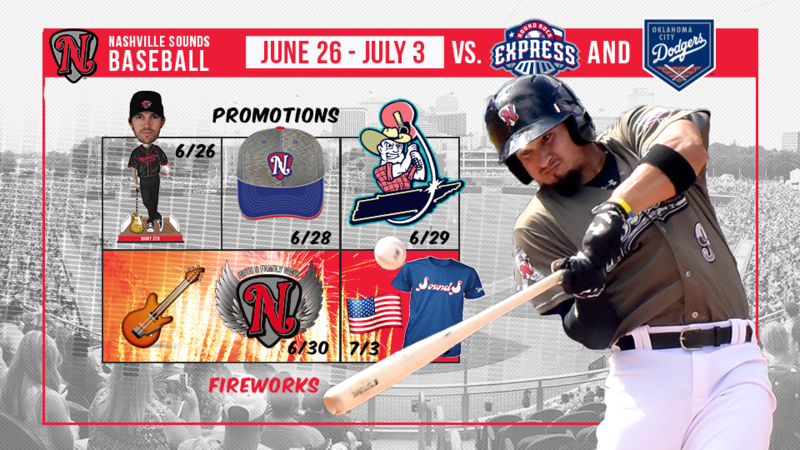 The Sounds welcome the Round Rock Express - the Triple-A affiliate of the Texas Rangers - for a four-game series from June 26-29. 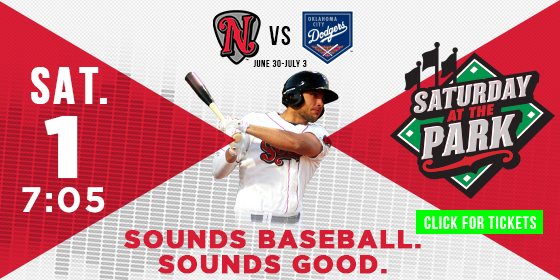 The second half of the homestand features a four-game set against the Oklahoma City Dodgers - the Triple-A affiliate of the Los Angeles Dodgers - from June 30-July 3. Monday, June 26 vs. 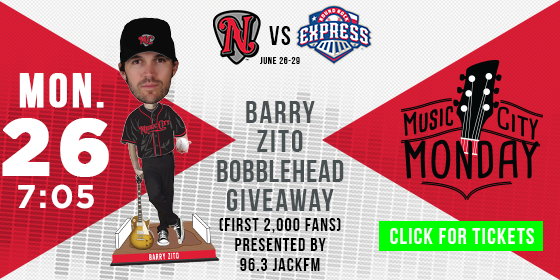 Round Rock - 7:05 p.m.
Barry Zito Bobblehead Giveaway to the first 2,000 fans. Tuesday, June 27 vs. Round Rock - 7:05 p.m. Pre-game autograph session with Oakland Athletics legend Rickey Henderson. The Hall of Famer will sign autographs (flat objects only & one item per fan) before the game from 6:00-6:20. 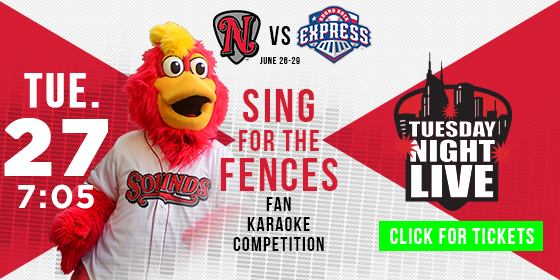 Tuesday Night Live - Sing for the Fences with live karaoke between innings. Who will take home the crown at First Tennessee Park? Wednesday, June 28 vs. 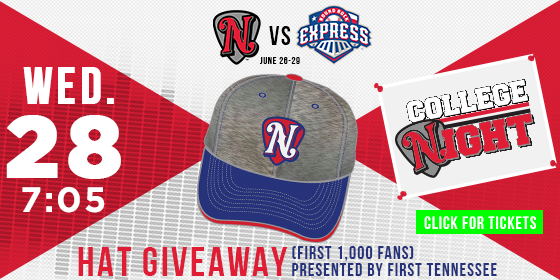 Round Rock - 7:05 p.m.
College Night - Tennessee State University/Nashville Sounds hat giveaway to the first 1,000 fans presented by First Tennessee. Thursday, June 29 vs. 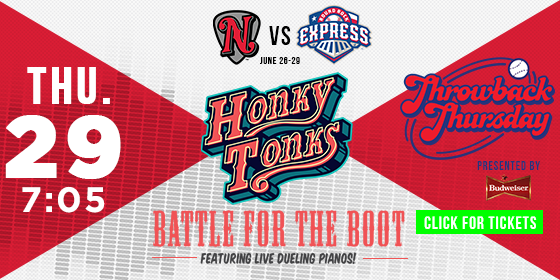 Round Rock - 7:05 p.m.
Battle for the Boot: For one night only the Sounds are changing their team name, logo, and uniforms to the Nashville Honky Tonks as the team defends the city's 'Music City' nickname against the Round Rock Express. The American Southern Division rivals will do the same in changing their name, logo, and uniforms to the Round Rock Dance Halls for this unique game between rivals. Pre-game music by various entertainers sets the stage for live dueling pianos performing on the Brauer Lounge deck throughout the night. The Honky Tonks jerseys will be auctioned off via silent auction during the game. Throwback Thursday presented by Budweiser - Fans can purchase Coca-Cola fountain soda and Budweiser draft beer specials for $2. Friday, June 30 vs. Oklahoma City - 7:05 p.m. Faith and Family Night presented by Trevecca Nazarene University & WAY-FM - Join the Sounds for a night of worship and baseball with player testimony. Grayson Reed/Cross Point Church performs a pre-game concert at the guitar scoreboard plaza with gates opening for the festivities at 5:30. A GUINNESS WORLD RECORDS™ record attempt: Join us as the Sounds attempt to set the world record for The Largest Air Guitar Ensemble presented by First Tennessee. Be a part of history with 2,500 of your closest friends on the field prior to post-game fireworks. FOX17 post-game fireworks presented by Koorsen Fire & Security. Enjoy the fireworks with a custom 1982 playlist. Saturday, July 1 vs. Oklahoma City - 7:05 p.m. Enjoy Saturday at the Park with visits to The Band Box and our family-friendly Fun Zone in the right field corner. Sunday, July 2 vs. Oklahoma City - 6:35 p.m. Pre-game autograph session with select Sounds players from 5:35-5:50. In addition, the Sounds promo team will host the coloring station for children to color baseball posters and sign up for on-field games. Post-Game Kids (ages 12 & under) Run the Bases. Monday, July 3 vs. Oklahoma City - 7:05 p.m. Independence Day Post-Game Fireworks Celebration presented by Nashville International Airport - Join us for the longest and loudest fireworks celebration of the season as we celebrate Independence Day at First Tennessee Park. The Sounds will sport special stars & stripes hats that will be available in the Sounds Team Store. 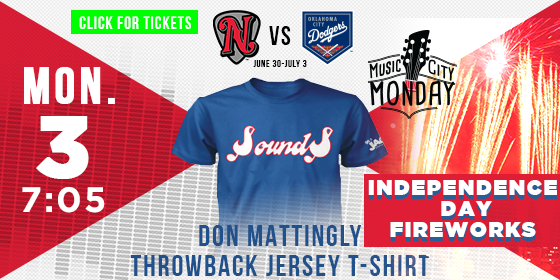 Don Mattingly Throwback Jersey T-Shirt Giveaway to the first 2,000 fans presented by Gibson.